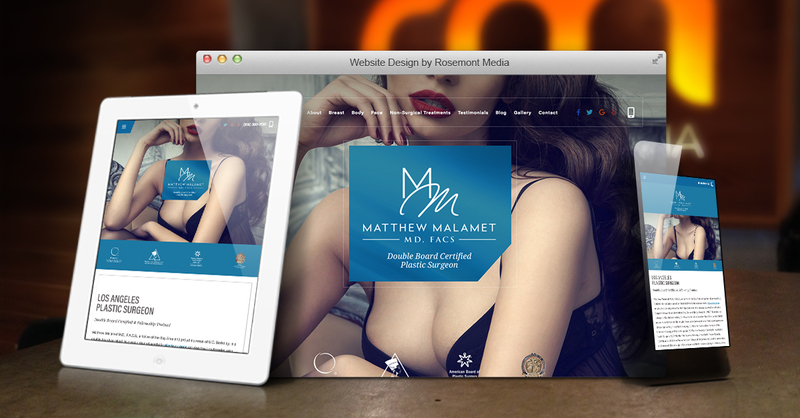 For the benefit of his practice and patients, Los Angeles plastic surgeon Matthew Malamet, MD decided to completely revamp his online presence with the help of Rosemont Media. The design celebrates feminine beauty and features a sleek, modern elegance, while the custom developed content, intuitive navigation, and digital media combines to create a captivating resource that visitors can easily explore. To connect with potential patients looking for the services and aesthetic results Dr. Malamet provides, medical SEO (search engine optimization) works to boost visibility in relevant Google searches. Additionally, the responsive design of the website allows it to fit and function optimally on smartphones, tablets, laptops, and desktop computers. Thanks to this revolutionary feature, mobile and stationary users alike can quickly learn about the latest procedures Dr. Malamet provides, browse the before-and-after gallery, and reach out to the practice for information and appointment scheduling. Want to see how a fully customized website can bring your medical practice to life online? We invite you to experience the Rosemont Media difference and explore www.matthewmalametmd.com for yourself!